Is it time to master your embroidery digitizing software and create your own unique embroidery designs? Echidna are proud to present “Hands-On Digitizing” workshops with John Deer. Become an embroidery digitizer and learn the age-old theory behind digitizing that’ll help improve EVERY aspect of your embroidery life. You'll enjoy a fun day of learning the fundamentals that go into creating beautiful embroidery. We’ll also cover the basic rules for stitch types, explanations of common terms used and tools available in every embroidery software program. This workshop is the ultimate digitizing experience for someone with ANY digitizing skill level & ANY software brand. The principles and fundamentals that you will learn will cross over to any embroidery software. John Deer has been the most awarded embroidery digitizer in the world for over two decades now. As a 4th generation embroiderer, John is one of North Americas leading experts on digitizing and embroidery for the corporate and home marketplace. John has an extremely unique history in the embroidery digitizing industry as he is one of the last two remaining Schiffli Masters in North America. John learned and apprenticed under Swiss Schiffli Master Digitizers (then known as “punchers”) over 30 years ago in his grandparent’s factory, before computers even entered the digitizing world. Since then, John has personally won 30 separate digitizing awards and wrote the book on digitizing called “Digitizing Made Easy” which has sold over 44,000 copies. John has produced hundreds of instructional and educational videos, which apply to embroidery enthusiasts of all levels. He has given hundreds of workshops and seminars all over the world & taught well over 100,000 people. Given John’s unique old-school training, family history, and vast embroidery knowledge, he is truly a master embroiderer & digitizer. Will everyone have to use Hatch at the event? I use a different embroidery software program already.. Yes, everyone will need to be using Hatch at the event as having everyone run the same software is the best way to smoothly run a hands on digitizing class. If you don’t have Hatch, you can get a 30 day FREE trial which you can use during the event. This will need to be installed onto your computer prior to the event. The theory and skills you learn during the training will be transferrable to other software. I got the trial of Hatch in the past, will I be able to get the trial again to use for the event? We will ensure everyone has access to the software at the event. Does Hatch work on a Mac computer? Hatch does not work natively on a Mac computer but you can get a programme called Parallels to be able to run Hatch on your Mac. I don’t really want to become a digitizer or I don’t really have an interest in digitizing designs from scratch. Will the content be relevant to me? Absolutely! Creating embroidery is an all round experience and understanding how the designs are created is an important piece of knowledge for any embroiderer, even if you don’t want to go on to create your own designs. You don’t need to have a portable internet connection for the event as we will supply Wifi for you at the venue. However, you will need to have Hatch on your computer to use during the event so we can all follow along using the same tools. Hatch has a 30 day free trial so if you don’t have Hatch, you can download the trial and set up the software a week or two before on your laptop so it’s ready to use at the event. Is there a discount for Platinum members? Event pricing is not discounted and is usually based on our fixed costs anyway. Platinum members do get priority attendance opportunities though. Oh no! We’re sorry you didn’t see it! Have a quick look through your spam/junk folders and your deleted items incase it got caught up when you were deleting something else. If you don’t have the email, make sure you’ve ticked the box on your Echidna account to receive future newsletters from us, you can find it by logging into your account and going to “Edit My Account Details” and look under your Email Address in the Contact Information section. I’m a beginner/experienced digitizer – is this event for me? 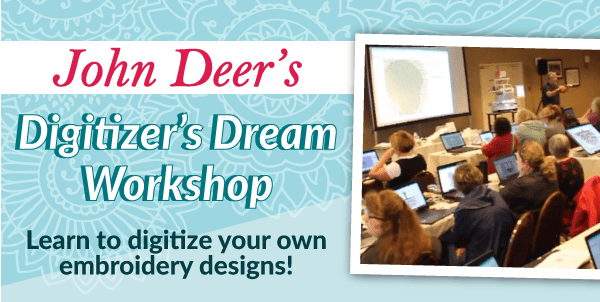 Yes absolutely, this event will cater to all levels and everyone will come away with expanded knowledge on embroidery digitizing, long with massive inspiration from sharing a room with other embroiderers for a couple of days!